Formal training for Mobile Crane Operators takes place at 3 levels. A Mobile Crane Operator is a person who transports and operates a mobile crane to perform lifts and hoists; assembles and disassembles cranes; and plans safe lifts and crane procedures including rigging and signaling. Crane Operators are required to work in all kinds of environmental and hazardous conditions under minimal supervision, and sometimes in confined spaces. Crane Operators may be responsible for operating a wide variety of makes and models of lattice boom, hydraulic boom and boom truck cranes. They may also be required to perform minor repairs and maintenance on the machines and related equipment. Crane Operators must have strong mechanical aptitude, above-average math skills, and the ability to communicate effectively with co-workers and supervisors. Physically, they must have stamina, a sense of balance, good eyesight and excellent depth perception. Crane Operators must work under stress and the pressure of deadlines. They may be required to pass a drug and alcohol test prior to being hired by a contractor. Our Mobile Crane Operator courses, Levels 1, 2 and 3, provide the in-school technical training component of the Mobile Crane Operator apprenticeship as approved by the BC Industry Training Authority (ITA) and as described in the ITA Mobile Crane Program Outline. To receive a BC Certificate of Qualification and Red Seal Endorsement, crane operators must successfully complete Levels 1, 2 and 3 training. In addition to this formal training, apprenticeship requirements include 5400 industry hours, with a minimum of 1800 seat-time hours. Further, operators must undergo a third-party assessment to receive a certification. The assessment consists of a four-part demonstration of practical knowledge and skills. Minimum Grade 10; the Industry Training Authority recommends Grade 12. The essential requirement is that applicants have the skills and knowledge to succeed in the industry. Applicants must score a minimum of 70 per cent on a Trades Assessment. Mobile crane operator training programs utilize an electronic logbook assigned by the BC Association of Crane Safety (BCACS). All crane operator trainees must register with BCACS before the first day of classes. Registration forms are available on the BCACS website. The Mobile Crane Operator Level 1 training program introduces the apprentice to the fundamentals of craning common to three types of cranes: Mobile Crane, Boom Truck and Tower Crane. The course is delivered in school over a seven-week period. 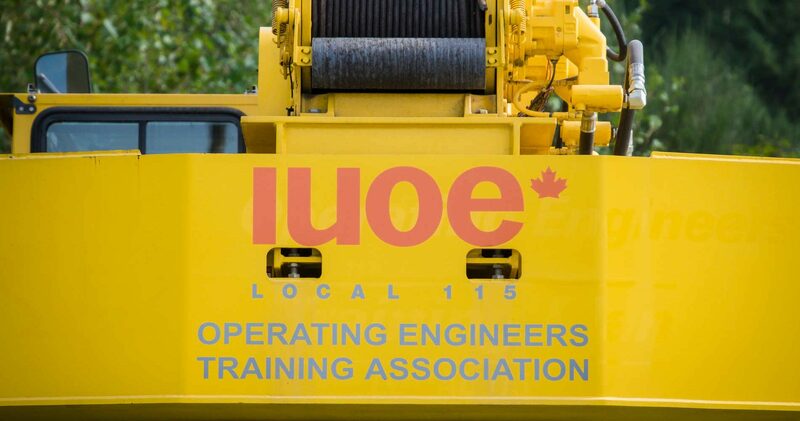 Trainees receive instruction in competencies, learning outcomes and performance standards set by industry and as outlined in the ITA’s Program Outline for Mobile Crane Operator Level 1. Students entering this program are registered as apprentices with the Industry Training Authority. Successful completion of the ITA Level 1 Exam is a pre-requisite for the Level 2 and 3 Mobile Crane Operator programs. The Mobile Crane Operator Levels 2 and 3 training program are taught in succession over a six-week period. The Level 2 training program builds on the fundamentals acquired in Level 1 and provides enhanced knowledge in craning operations through four weeks of formal instruction. The Level 3 training program introduces specialized craning operations such as heavy lifts and pile driving. It is delivered over a two-week period immediately following Level 2. In both Level 2 and Level 3 programs, you will receive instruction in competencies and performance standards set by industry and as outlined in the ITA Program Outline for Mobile Crane Operator. The Level 3 curriculum focuses on specialized operations. Candidates must score a minimum 70 per cent in the standardized written exams that are administered at the end of Level 1 and Level 3 training. Candidates must score a minimum of 70 per cent on the Interprovincial Red Seal Exam before being approved for the Standardized Practical Assessment. Candidates must achieve a “Pass” in the Standardized Practical Assessment in order to receive a BC Certificate of Qualification and Red Seal Endorsement.